HHCo: Could you tell us initially a little about your practice and what led you to art and design, and in particular screen printing? LH: My degree was in English Studies, which is really an investigation into the general mechanics of communication when you’re an English speaker. When I began producing artwork ‘for usage’ - design, illustration, graphic art - I was really just playing. But gradually, as the projects got more interesting, it became partially about experimenting with some of the ideas I’d latched on to during my degree to do with symbolism and signification in language, and partially playing with the emotional effects of aesthetics. I love bold, flat colour, and people respond very strongly to it; so it’s remained at the core of what I do. HHCo: You work a lot with music, can you talk us through that a bit ... in particular how music and the visual work that surrounds it, can lead to inter-cultural insights and/or dialogue. LH: The majority of my work was related to music up until very recently. It developed through the music promotion I was involved in over a decade ago; I’d always loved making covers for mix tapes and CDs, so when I started DJing, playing live and bringing acts to Nottingham, I was excited to work on the posters and promotional artwork myself. I became fascinated by the effect of connecting an image to sound; how you could create a feeling without even depicting anything in particular necessarily, just pairing music with colour and form. Music (without lyrics) is an abstract art form, and so it permits you to pair it with something equally abstract if you wish. It’s very liberating. When it comes to record sleeves - which essentially provide a window on to the universe of the music contained within, but also have to grab the attention of an audience to help with sales - you have a challenging role to play, especially when working with music that’s under-represented in countries outside those of its production. With the artwork, you’re always trying to act as a bridge between the music and the audience. The more distant the culture that produces the music from the place it’s being marketed, the more vigilant you need to be to maintain that bridge, and not let it become a telescope, looking with dislocation from afar. The aim is to create dialogue, and to make sure there’s more of the music on the sleeve than the market being sold to. Draw the audience in; don’t project. This is why so much album art was disappointing to me in the early 2000s, because CDs and digital had reduced its impact through the shrinking of format. I - and everybody I have worked with - have been determined to fight that market instinct. My approach was to draw from the source first (find out what the artist wanted, see how much of that was viable from the label’s point of view), and try to move towards freshness and future as people grew accustomed to it, in the hope of gradually helping eradicate the clichés and tropes that act as a barrier to real cultural understanding. The ultimate aim is for recognition to be such that you’re back to being able to do whatever you and the band/producer wants, without market forces mitigating the decision. We’re so much closer to that point now than ever, I think, because the internet has made the world smaller, and the unusual is (I hope) rewarded; but also because as digital citizens, we are appreciating the physical again. It’s an exciting time in music, I think, despite the uncertainty. HHCo: We've focused on a few origins with the commissions you are doing for Hundred House. Particularly, origins that provide a cross-over with music you work with. Can you tell us a bit about what you like about some of these origins ... music, culture, art. What you've enjoyed the most. LH: I’m struggling to know where to start, or where to go with this question. There’s just too much. I’ll try: I've produced artwork mostly for music from Kenya, Ethiopia and Colombia specifically from the countries you source from, through the labels I work with. Almost every record from these regions that I’ve produced artwork for has been a revelation in terms of what music can do, but I’ve not actually managed to travel to any of them yet so I rely on the musicians and labels for the information. The 2-Vol Soundway compilations Kenya Special were the biggest eye-opener music-wise from Kenya. The Rift Valley Brothers’ Mu Africa was a big tune at our Sofrito nights, but Hinde by African Vibration blew my mind the first time I heard it. All of the releases I’ve worked on have been produced by the musicians for commercial distribution, except maybe ‘Out of Addis’, which was a set of recordings of musicians (with their blessing) in communities beyond the Ethiopian capital captured as part of a fantastic film called Roaring Abyss. It gives you a glimpse of the phenomenal diversity of the one African country that resisted colonisation. One of my favourite sections of the film is an explanation from a musician about the Dorze (a tribe famous for its expert weaving) traditional music, which, he says, includes vocal tuning taken from local bird species. Each vocalist as part of the village choir has their own pitch - rather like an organ where each key/note is an individual person - or sub-group refrain, and the melody is built up through rhythmic sequencing of a call and response pattern between the two concentric semicircles of musicians. The effect is a hypnotic, deeply complex and utterly beautiful polyphonic composition, and the cooperative nature of it also has a community-binding power. You have to mention the vast Ethiopiques series for anyone wanting to hear a broad range of Ethiopian music, and we’re all surely aware of Mulatu Astatke by now. 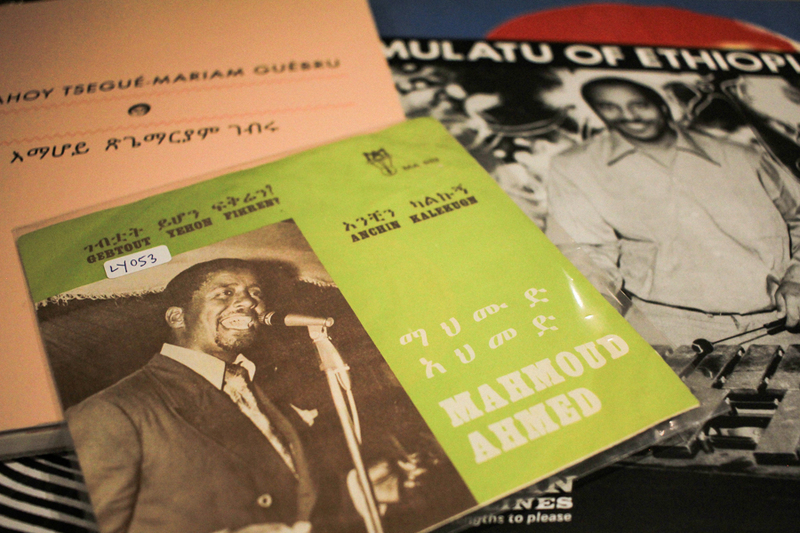 I have a 7" by Mahmoud Ahmed, Bebtuat Yihon Fikire, that I listen to a lot... Alemayetu Eshete, Emahoy Tsegué Maryam Guèbrou, Hailu Mergia, all favourites... the latter is doing some brilliant stuff right now. I saw him play with Tony Buck and Mike Majkowski a couple of years back, and it was one of my favourite gigs of recent years - a killer combo. While a lot of record sleeves between 50s and 70s used limited colour palettes, there's something about Ethiopian sleeve designers' use of block colour and photo cut-outs that I particularly love. In Colombia, the northern Bolivar and Atlantico regions bordered on the east by the Magdalena River - containing Cartagena, San Basilio de Palenque, Barranquilla - is the area that I was introduced to first, through Cumbia and Palenque music. My first job with Soundway was designing the cover for the Banda Los Hijos de la Niña Luz Déjala Corre 45, and I'd never heard anything like it. Then hearing the big band cumbia from Discos Fuentes and the sublime porros, boleros and merecumbes of Lucho Bermudez, I was completely in love. I went through a period of being obsessed with the hypnotic bass-led sound of Los Sonéros de Gamero after seeing footage of lead vocalist Irene Martinez ripping up a carnival in her 70s. The history of Palenque - as the first 'free town' established by liberated slaves in the Americas - and the music culture that comes from it is incredible. In fact, their picó soundsystems (at least the music they play - I've not yet been given one to paint on, much as I wish I had) are the benchmark when it comes to the kind of dancefloor we aim for at Sofrito. I referenced the fantastical picó artworks on Quantic’s Los Miticos Del Ritmo LP, but the things themselves are something to behold. There’s some really great stuff coming out from the stable of Ondatrópica’s Mario Galeano Toro - Frente Cumbiero and Los Pirañas - and I love the trippy, off-kilter work being made by the Meridian Brothers and family. I think I’d better stop there, it’s become an essay already! LH: Yes it’s so great to see your work with the farmer co-ops, and especially to be able to actually see the people who harvest and prepare the product. For us, probably the best, most direct form of impact you can make is in live programming and organising band tours, I think. But I’m sorry to say this is becoming significantly harder with our Home Office refusing more and more artist visas, so it’s a struggle, at least when it comes to bringing musicians to the UK. Luckily Hugo (Mendez, who runs the Sofrito and Nouvelle Ambiance labels) is able to work with musicians in France, since he’s Paris-based. On the record release side, which at least bypasses the travel issue somewhat, things are a bit easier. As the graphic artist, I’m very rarely privy to the actual meetings between musicians and labels, but the ideal is to be able to work directly with the musicians so as to ensure that they receive a fair deal. Doing that is easier than ever thanks to the internet. There are a lot of historical structural issues within the music industry that are still being unpicked, especially when dealing with old recordings; but the direction is positive, I think. Bootlegs used to be rife, but they’re not tolerated any more. License-holders for older recordings are often not the musicians themselves, and unless you manage to catch a current performer or unreleased recording stashed under the artist’s bed (as was the case with Peter King’s incendiary ‘Shango’, put out by Strut in 2002), it’s really hard to give dues to the people you’d ideally want to. But this is why Soundway and - more recently - Sofrito have been trying to push forward to current producers, because you’re far more easily able to establish a new, fairer model with the musicians in what is often a hair-raisingly confusing, fast-paced and constantly-mutating industry. I’ve only been working in it for a decade or so, but it definitely feels like musicians worldwide are not so beholden to labels any more, again thanks to the web; this realisation alone has had a monumental impact on the general power-imbalance that gave industries working with producers in countries across Africa and South America a reputation for being exploitative. Again, it seems to me like people are not just willing to pay for smaller batches of ethical products, they’re actively looking for it, which in turn means that smaller groups at either end are better able to trade to the benefit of those making them. Manana Festival, Cuba, was an excellent example of that, I think: the first electronic music festival in the country, they organised it as a collaborative venture, with Afro-Cuban musicians working with international producers using music technologies the country hasn’t yet been introduced to due to the trade restrictions. The result was astonishing, and Manana is continuing as a label, releasing the results of these collaborations. It was a real privilege to have been involved. As for us at Sofrito, you just hope that the small act of releasing a record with a band or musician you think ought to be better appreciated will be disproportionately impactful, because you can’t expect that putting out a relatively small run of vinyl will make a huge difference. As it happens, we’re continually finding that represses are in constant demand. So something’s definitely going right at the moment. HHCo: What projects have you got coming up that we can be looking out for? LH: I’ve just finished my third sleeve for producer DrumTalk, which I can’t wait to reveal. That looks to be coming out early 2019. Next up is an album cover for a legendary jazz group that I can’t name for some time, frustratingly! Hugo Mendez has been working with a great Parisian designer for his killer debut release on Nouvelle Ambiance, but I’m still helping here and there. I’m starting work on the next single with him soon, which I can’t wait to get my teeth into. I’ve just finished a little psychedelic animation promoting Rome Psych Fest in November, and I’m aiming to continue my animation sketch project on Instagram over winter with a view to diving deeper into animation next year. HHCo: Where can readers find your work?